I hope you’re excited for Freebie Friday because this one’s a really good one. Chances are you’re already pretty familiar with Juicy Couture, but they’re one of my go-to brands for fun, glamorous and feminine fashion. Me in my bright yellow Juicy Couture jeans from last summer that I just adore. I’ve been a fan of Juicy’s for a long time and today I wanted to spread the love. That’s why I’m giving away not one but three of my latest must-haves from Juicy. I am so excited for one of you to get to try them all out. I’m big into tassels right now so I chose a bag and a necklace that both touch on that trend. And just wait until you smell Viva La Juicy, which has got to be my favorite fragrance from the line. To enter to win, just follow me on Twitter, and then leave a comment below telling me why you want to win by next Thursday, February 23rd. I’ll pick a winner at random to announce next week. Good luck! UPDATE: A big congrats to MollySims.com member Kim Pincombe-Cole! 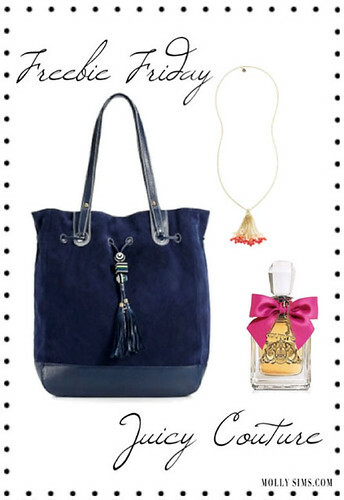 I hope you enjoy my favorite things from Juicy Couture! • This giveaway ends at midnight PST on February 23, 2012. • Juicy Couture was kind enough to provide me with this prize to give away. This is not a sponsored giveaway in any way.